Gooding announced three racing Ferrari berlinettas for the Pebble Beach 2018 auction: a 275 GTB/C, a 250 GT Tour de France, and a 166 MM/195 S Berlinetta Le Mans. 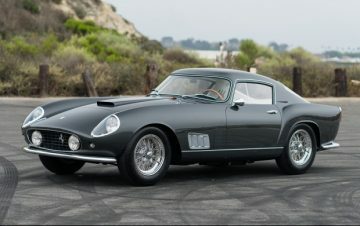 Three competition Ferrari berlinettas are the latest top cars announced for the Gooding Pebble Beach 2018 classic car auction. The 1966 Ferrari 275 GTB/C (Estimate: $12,000,000 – $14,000,000) is one of only 12 built and was originally raced by Pedro Rodriguez for Luigi Chinetti’s North American Racing Team (NART). The 1959 Ferrari 250 GT Tour de France (Estimate: $6,500,000 – $7,500,000) was originally raced in Italy before making its way to the US. 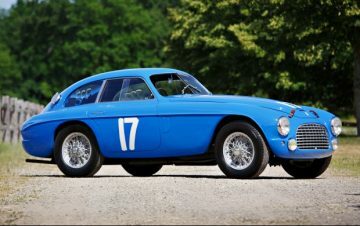 The 1950 Ferrari 166 MM/195 S Berlinetta Le Mans (Estimate: $6,500,000 – $7,500,000) was originally raced by Ferrari in Italy but later owned and raced by Briggs Cunningham at Sebring. Ferrari offered competition-specification GT cars to customers who demanded automobiles that were equally at home on the road or track, starting with the Ferrari 166 MM Berlinetta of 1950. 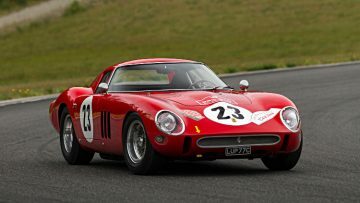 This practice continued with the subsequent 250 GT chassis, and 275 GTB chassis. The Ferrari 275 GTB/C is the ultimate evolution of the single-cam berlinetta. Ferrari built just 12 examples of the 275 GTB/C purpose-built competition cars. The bodies were among the thinnest aluminum shells ever built for a Ferrari, with the windows and rear screen made of lightweight Perspex instead of glass. Combined with Borrani aluminum-rimmed wire-spoked wheels, this completed the package. The 3.3-liter V-12 engine features high-lift camshafts, 250 LM-type valves, competition pistons, a redesigned crankshaft, and Weber 40 DFI/3 carburetors. In addition, the engine is also set up with dry sump lubrication in place of the standard wet sump road-going system. 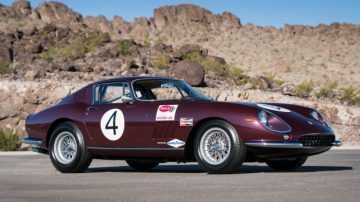 This 1966 Ferrari 275 GTB/C, chassis 09063, (Estimate: $12,000,000 – $14,000,000) was initially purchased by North American Racing Team (NART) founder Luigi Chinetti for legendary racing driver Pedro Rodriguez. Rodriguez campaigned the car at the 1966 Nassau Tourist & Governor’s Trophy, placing 7th overall and first in class. The car was then raced at the 1967, 1969 and 1970 24 Hours of Daytona and then subsequently owned and raced by numerous caretakers. In 1992, 09063 was acquired by Albert Obrist, who had amassed one of the greatest Ferrari collections of all time. During his ownership, Mr. Obrist had Italian specialists Giuliano Michelotto and Dino Cognolato restore it to concours quality in the original Rosso Rubino livery it wore when new. In 1995, Formula 1 executive Bernie Ecclestone acquired the Obrist Collection and the current owner purchased 09063 in 2001. Today, the 275 GTB/C continues to present in excellent overall condition, a lasting testament to the high quality of the expert restoration carried out under Obrist’s ownership. The car is also accompanied by an impressive dossier of supporting documentation including copies of the factory build sheets, period photographs, magazine articles, correspondence, service records, and a history report compiled by Ferrari historian Marcel Massini. 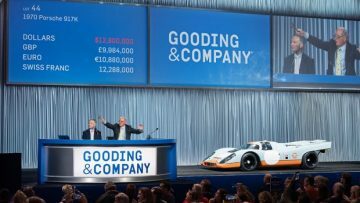 The estimate is slightly lower than the model record of $14,520,000 that Gooding achieved at Pebble Beach 2017 with a 1966 Ferrari 275 GTB/C, chassis 09051. Built in 1958, the 1959 Ferrari 250 GT Tour de France, chassis 0905 GT, (Estimate: $6,500,000 – $7,500,000) is the ultimate evolution of the Ferrari 250 GT Tour de France. This car is one of only 36 single-louvre competition berlinettas and is equipped with many unique features not seen on any other Tour de France. The Ferrari was first raced at the 1958 Targa Florio, then at the XVIII Trieste-Opicina hillclimb by Pietro Ferraro, and placed 3rd in class. Following these races, the Ferrari made its way to the United States in 1962 and was eventually purchased by Fred Peters through Charles Betz, two well-known Ferrari enthusiasts and collectors, in 1966. In 2014, the car was completely restored to its distinctive original livery of metallic grey over a light grey interior. 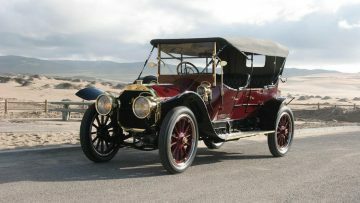 Following its restoration, the car was shown at the 25th Annual Palm Beach Cavallino Classic and won the Coppa Bella Macchina Award. This is wonderful opportunity to acquire one of the most beautiful Ferrari berlinettas in existence, which has not been available for public sale since 1966. The estimate is in line with results at recent auctions for Tour de France berlinettas. The 1950 Ferrari 166 MM/195 S Berlinetta Le Mans, chassis 0060 M, (Estimate: $6,500,000 – $7,500,000), is a thoroughbred competition Ferrari, based on the highly successful 166 MM/195 S chassis with aerodynamic coachwork by Carrozzeria Touring of Milan. One of only six examples of the Berlinetta Le Mans, the factory campaigned this Ferrari in Italian races, as well as displayed it at the 1950 Paris Auto Salon on Luigi Chinetti’s stand. The car was then sold to famed American sportsman Briggs Cunningham, and raced at Sebring, Buenos Aires, Watkins Glen and Bridgehampton through 1952. Later owned by Road & Track writer Henry N. Manney III, the Ferrari eventually made its way to the UK, where it took part in many important European events including the Mille Miglia Storica and the Goodwood Festival of Speed. Beautifully restored and presented in its original light blue livery, 0060 M ranks among the most important early competition Ferraris. This historic car will grant its new owner entry into the world’s most exclusive classic car event and is presented today in its original Sebring livery from 1950. Gooding sold this Ferrari previously for a model record $6,490,000 at the Gooding Scottsdale 2016 sale.